Anymore you can’t walk into a home without seeing a few mason jars on display at some point in the home. Whether it be what they are serving ice tea in, painted up and set on a table for decor, or even turned into lights. Mason jars are everywhere, and I have even more amazing ideas on how you can use them, check out these diy mason jar lights below. 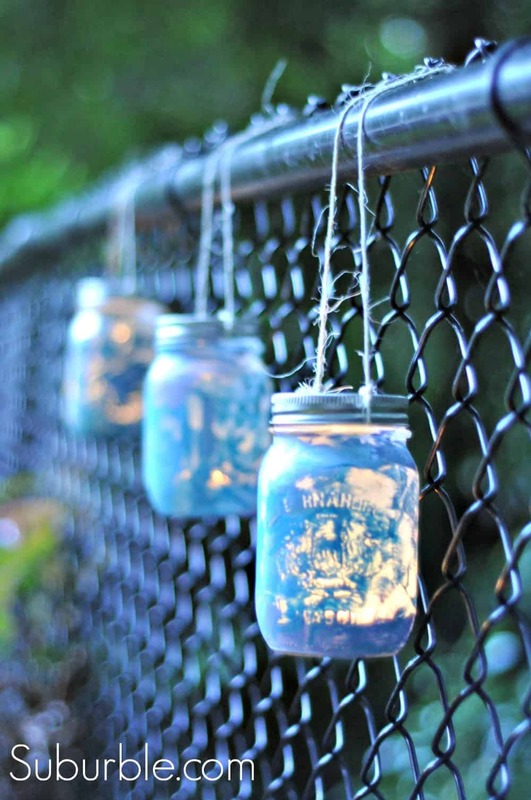 Kim at Today’s Creative Life shares another amazing and creative diy using solar lights and mason jars. These are a great way to add curb appeal to your home, dress up outdoors for parties, and give your outdoors a makeover. Check out how she made them. 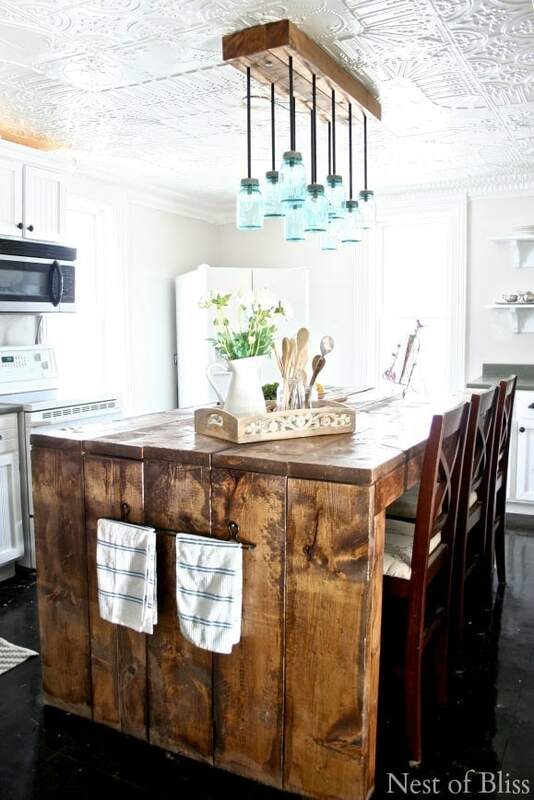 Here is a really rustic style mason jar light fixture over at Twenty 8 Divine. 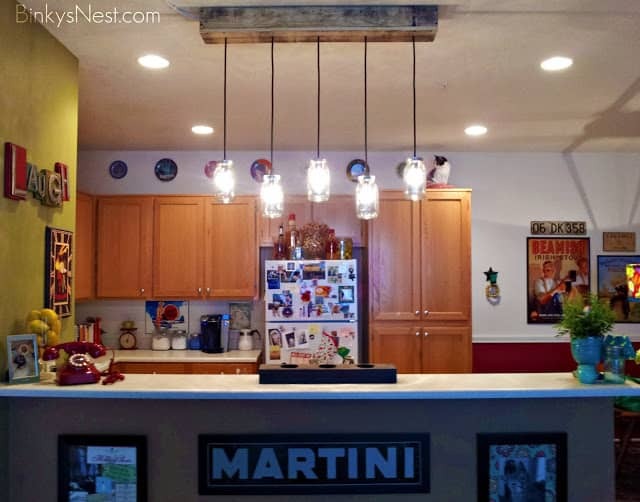 They transformed their kitchen with this light fixture and it turned out really nice. Thinking to do one like it? See how they made it. Rizza at DIY Projects was looking for a chic and affordable light fixture. 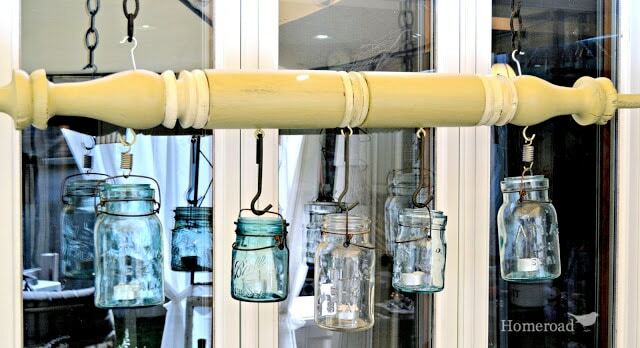 That is where the mason jar chandelier diy came about. A really neat idea that can totally change the feel of a room. Check it out. 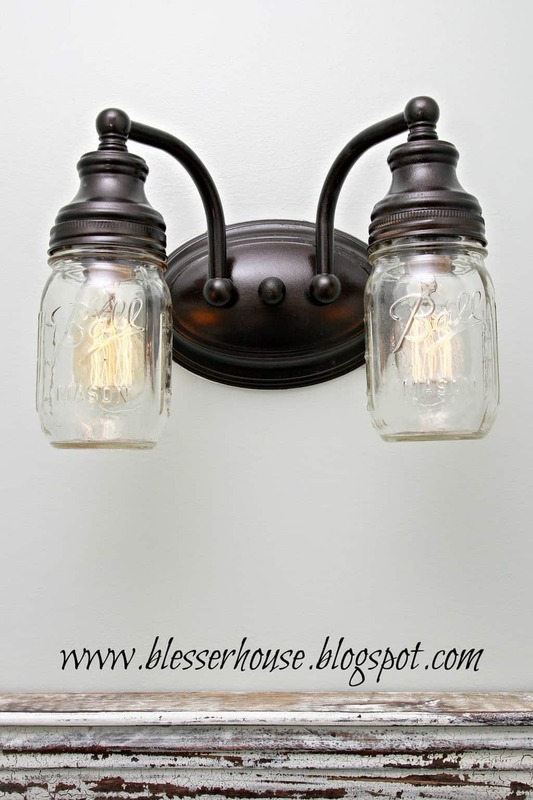 Bless’er House shares how they took an old light fixture and updated it with some mason jars. It turned out really well, and gives the bathroom a new rustic feel. Learn how to make one. Kelly at Here Comes the Sun has a real love for blue mason jars. 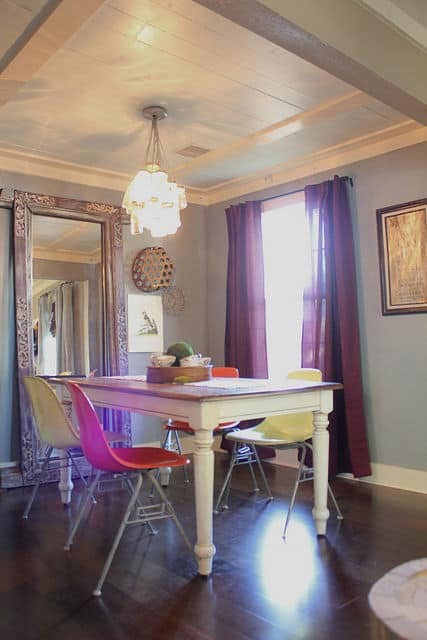 So she decided to give the light fixture that sits over their dining table a makeover. This adds the perfect amount of color to the room. Head over to see how she made this. Homeroad made this really neat light that uses votive candles. Their daughter likes to call the spindle used a giant peppermill, so I thought it would be fun to call it that too. Make one like this following their tutorial. 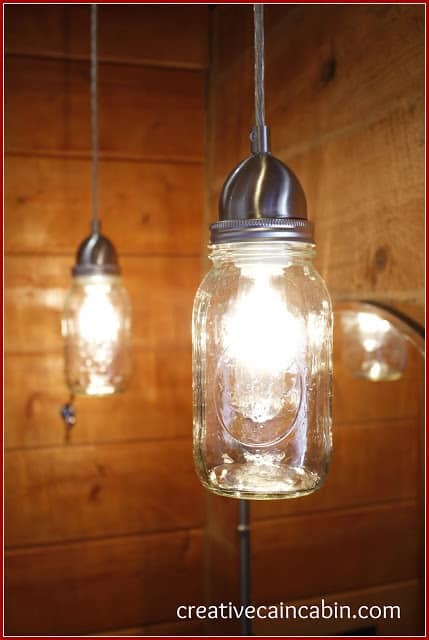 This cluster style mason jar lighting is really unique. 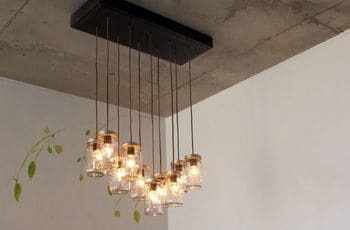 Instructables shares step by step how they created this really stunning lighting for their home. Check it out. 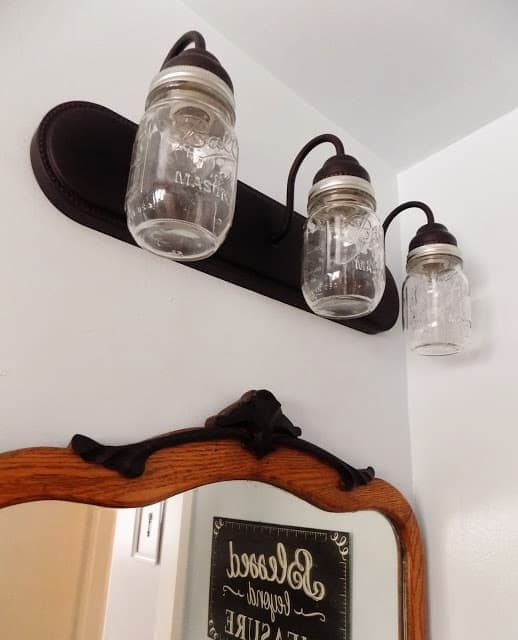 Brandi over at Brandi Sawyer created this rustic farmhouse style lighting using mason jars. It turned out incredibly well and doesn’t look like it is that complicated to do. See how you can make your own. 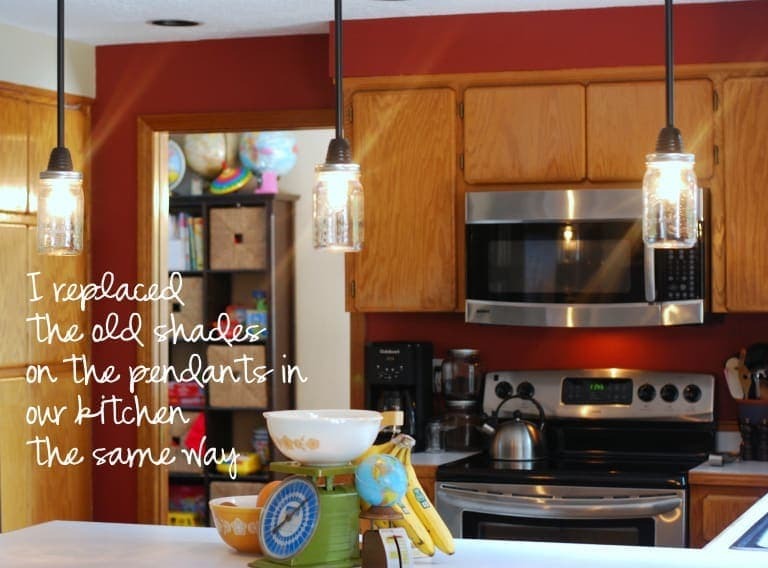 Home is Where You Make It really got creative with this pendant mason jar light. They wanted an upgrade, and we all know diy’s are the best. Learn to make one like it. 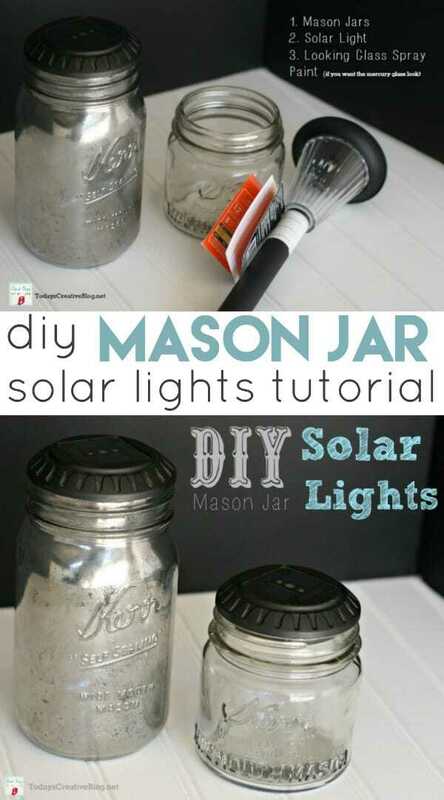 Garden Therapy has a solar light tutorial using mason jars that will dress up your outdoor space. Perfect for those summer nights of entertaining and looking at the moon. Create your own from their tutorial. 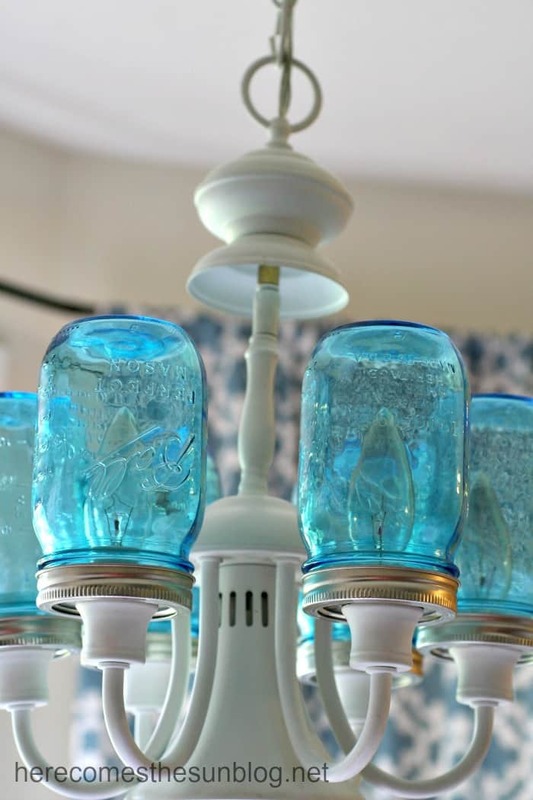 Crafts Unleashed shares a 5-minute lamp revamp using the glorious mason jars. 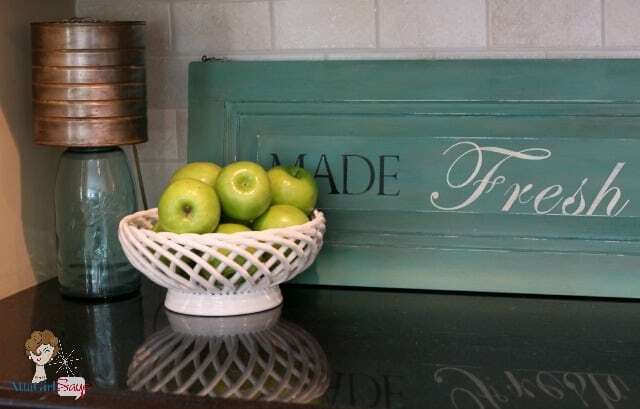 This is a super easy craft, but it can add a totally new look to your room. Check out the tutorial here. The Quaint Sanctuary created a whole new style in their bathroom, by simply changing out the lighting. If you are wanting to work at adding your own style and personal touch to your bathroom, you might like this idea. See how they did it. 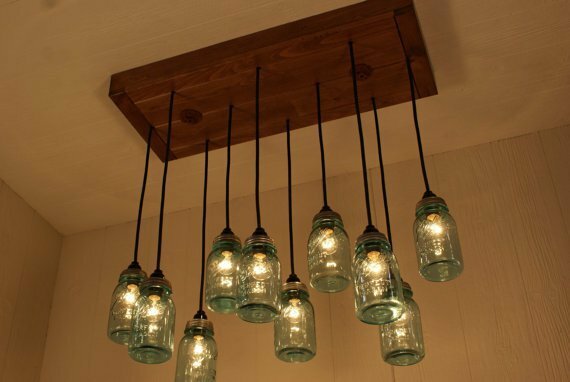 Instructables shares a great tutorial on how they created this rustic row of mason jar lights. It was a great tutorial to give your home a new makeover in no time. Learn to make your own. 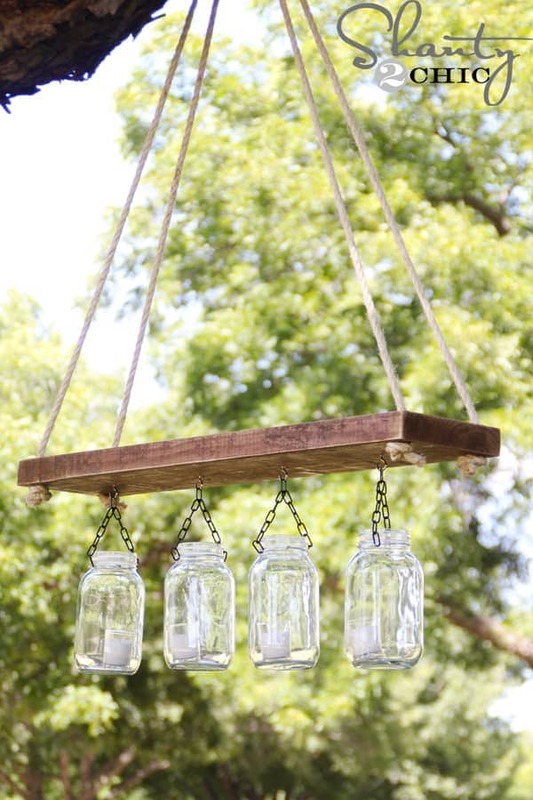 Shanty 2 Chic created this mason jar chandelier in an afternoon, for just $10! This is a very easy craft with great results. Find out how she did it. Atta Girl shares a really stunning lamp that will add a lot of style to your room. 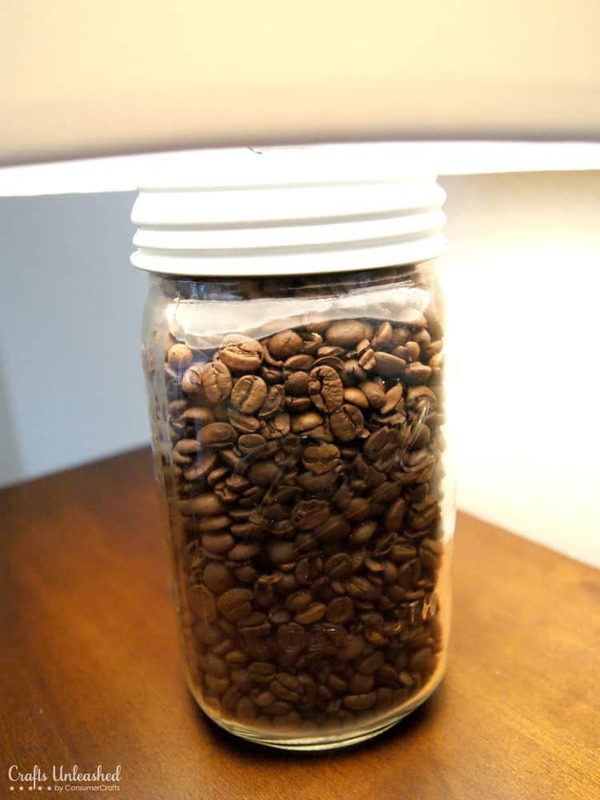 You use an old can to create a really marvelous mason jar lamp. Learn to make your own. I love the transformation Creative Cain Cabin did for their bathroom lighting makeover. I love the silver/chrome look paired with the unique light bulb shape and mason jars. Find out how they did this. This isn’t a full on true lighting but it is great for outdoor lighting. 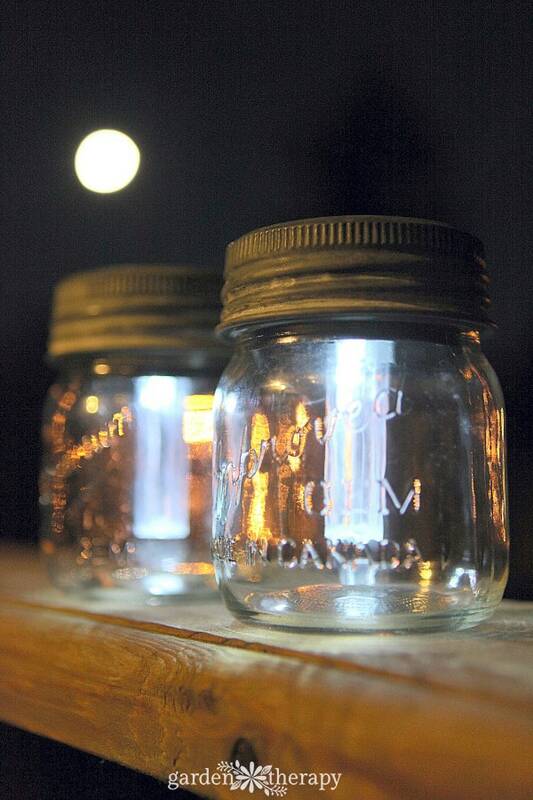 Suburble shares how they painted mason jars, strung lights and created a nice ambiance outdoors. See how they did it. 17 Stunning ideas above for you to use your mason jars and give your home that rustic, modern feel that will wow your guest as they walk in the door.